stAllio! 's way: note to indy star: hire more editors! 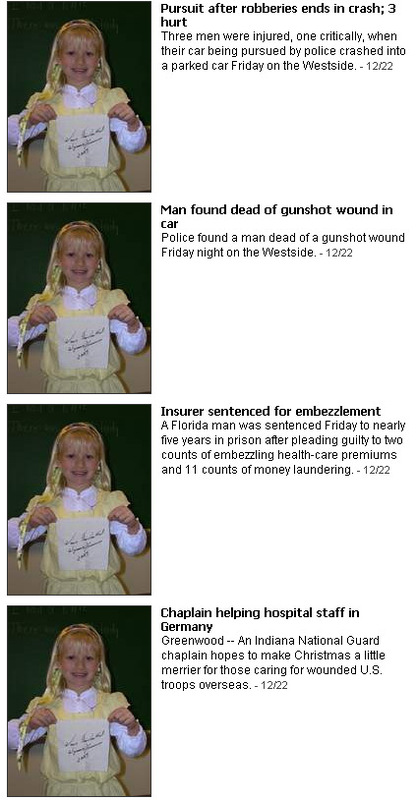 stop by the indy star's local news page today and you might be horrified to discover that the same young blonde girl is apparently involved in two robberies and a car crash, a murder, an insurance embezzlement scheme. but she's not all bad: she also enjoys quilting and helping germans. all that and she's only 7! or, perhaps someone at the star screwed up when filing the girl's photo—which only belongs with the quilt story—and somehow it got attached to four other stories, confusing the folks on talkback. but then they're often confused. i originally wasn't going to post about this when i first saw it at 8:30, as i had no right to be up so early on a saturday and figured it would be fixed soon. but now it's 12:30. this has been up for four hours now, or probably more. how long before someone at the star notices it and fixes it? this doesn't just affect the local news page: each one of these individual news stories features the girl smiling out at you, proudly displaying her signed quilt square, while you read about some dude who was found dead in his car. at times like this, you can really feel just how understaffed the star is these days. Some people should never have been taught "cut and paste".